No matter what age you are. Creating music engages your entire brain, opening your mind to learning in every way: memory skills, mathematical skills, social-emotional skills, coordination and physical skills, self-expression. 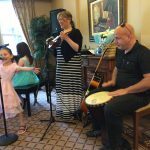 Our easygoing approach to music lessons encompasses all of these skills including a love, passion and appreciation for music. 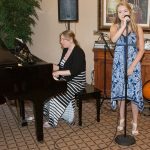 Each student also has the opportunity to perform in our recitals, held twice a year. Not sure what instrument to start your child off with? Learning how to play piano is the perfect foundation to springboard into any instrument! We offer piano instruction in a fun low-pressure environment. 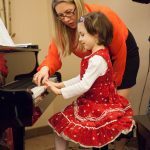 Our piano lessons cater to the young beginner, accepting students as young as age 4, as well as youth, teens and adults. This is a terrific instrument for little fingers in particular for pre-guitar learning! Easy to play popular and fun for children as well as teens and adults. Learn chording, melody, rhythm and songs. 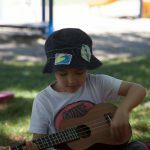 We offer ukulele lessons for beginner students aged 4 to adult. This popular instrument is always a fun addition to a party or family event! 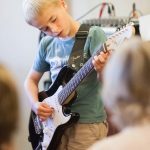 Our fun and easy approach will have you playing the guitar in no time, encompassing technique, rhythm, melody and chording. We offer guitar lessons for beginner students aged 7 to adult. An essential part of the band is drums! Lessons are taught by professional drummer, Neal Burstyn, in our home studio location only. From basic beat and time to complicated fills and polyrhythms, instruction is available for drummers of all skill levels. We offer drum lessons for students aged 7 to adult. Lessons are available on a weekly basis in 30, 45 or 60 minute sessions. School year weekly commitment is September or January through June with monthly post-dated cheques provided. Cancellation fees will apply for early termination of lessons. Lesson cost does not include the cost of books and other materials.